The purpose of this document is to provide details on importance of aggregation, how effectively we can design aggregations, performance monitoring & usage based aggregation. The aggregations are the high level summaries of data. 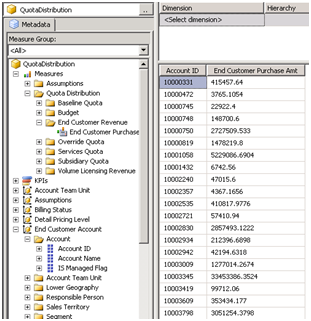 It is analogous to calculated value by GROUP BY statements of T-SQL with some attributes. SQL Server pre-aggregates the measures with respect to dimension attributes at some extent instead of executing the query runtime. Pre-aggregation improve the query performance. I. 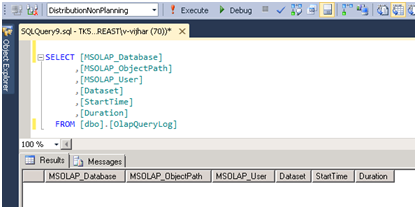 Create QueryLog table è True will create a table named OLAPqueryLog in DB based on connection string in QueryLogConnectionstring. III. QueryLog sampling: The default value for this property is 10, meaning that 1 out of every 10 server queries is logged. 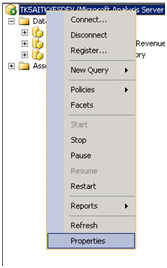 I set to 1 to log all the queries hit to cube. 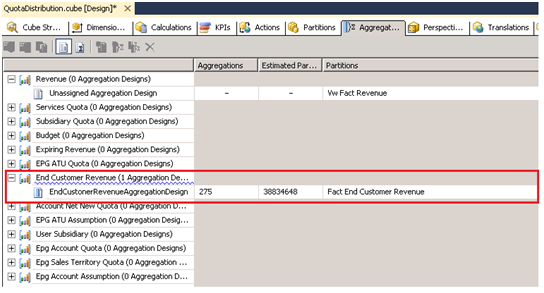 I have browsed the cube for End Customer revenue fact and logging information with fact name & query execution duration is properly logged in the OlapQueryLog table. Based on the above statistical data, if we feel that query is taking time and performance of the query can be improved. In this case, we can go for the designing aggregation for Fact EndCustomerRevenue. I. 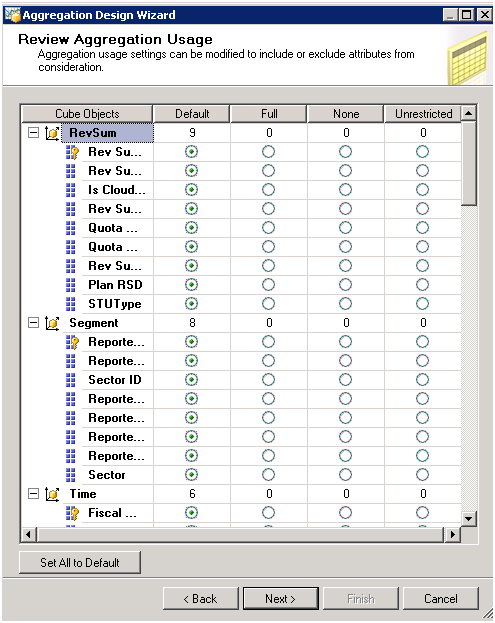 For designing the aggregation, open the cube solution and go to Aggregation tabè End Customer Revenue fact. 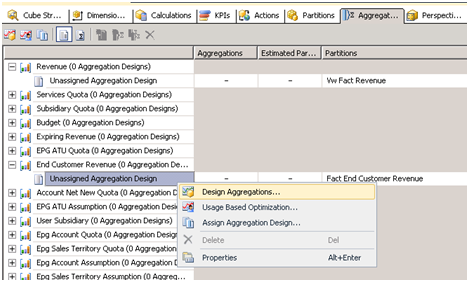 Here it is showing ‘unassigned aggregation design’, it means there is explicitly aggregation designed for this fact. III. It will open Review Aggregation Usage window. Here if we want to exclude any dimension attributes from aggregation, we can remove it to avoid unnecessary aggregation. IV. It will open the object count window, either we can enter the estimated count value or wizard will automatically count the row. Entering count values manually will be good in case of bulk amount of data because wizard may take lot of time to count. 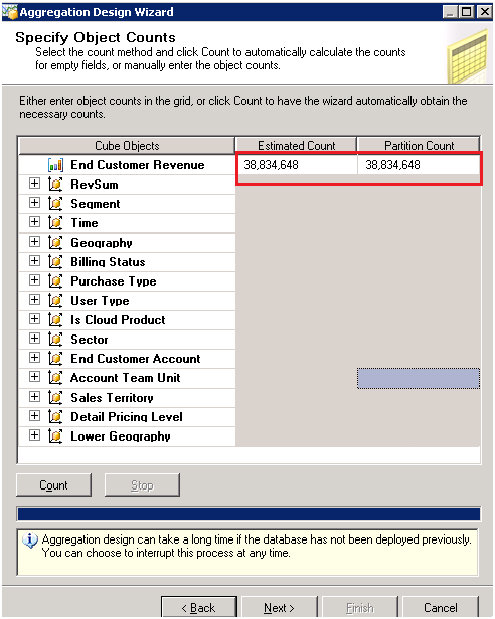 While specifying the value manually, make sure value should be nearer to exact count because the Aggregation Design Wizard uses the object counts to estimate storage requirements. V. Next is Aggregation option. 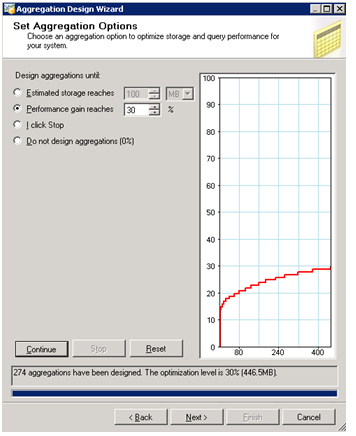 It will provide an option to design aggregation with respect to storage space or performance point of view. · Set the storage size and let Microsoft® SQL Server Analysis Services determine which aggregations to store. This approach works well when you have limited storage space. · Set the percentage of performance gain and let the necessary aggregation tables take as much storage space as they need. · I click Stop: Manually determine the best balance by watching the progress of the Performance vs. Size graph. I am selecting Performance gain because for many applications, performance is more important as compared to storage space and Cube processing time. It creates 274 aggregations with occupying 446.5MB disk space. Save the aggregation name. We can either deploy the changes now or we can save only. Click finish. The problem with the Aggregation Design Wizard is that it assumes all queries are equallylikely. Therefore, some of the aggregations it designs are likely to be useful, but some will not be. More importantly, there will be aggregations you need that are not created by the Aggregation design wizard. 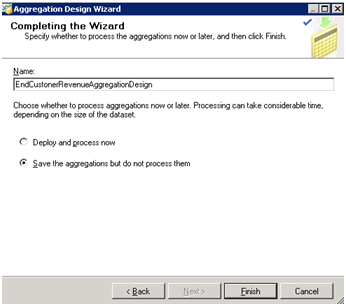 To create those aggregations that are required but aggregation wizard does not created, we can use usage based optimization. Based on the logging information, if we found that we need some more aggregation then we can check the box against the associated dimension attributes. If we feel some of the aggregations are not required and wizard is creating unnecessary, in this case, we can uncheck it. Removing unnecessary aggregations will helpful to manage disk space for the partitions as well as it reduce the cube process time. i. Storage space required for the aggregated table is more. ii. Processing time for the cube is more. 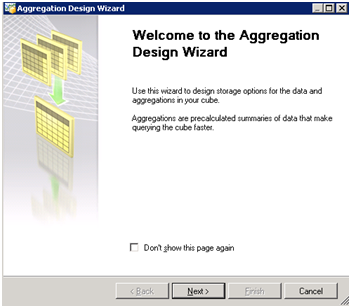 By using the above steps, we can understand how to design aggregation to improve cube query performance and based on user’s action, we can do optimize the aggregation to provide best performance and adequate disk storage to the cube. This is a very good article. I have shared your link in my blog. A good article which was very easy to understand without being complex. Thanks for spending such a time for sharing your thoughts with us. Hai.. This is really good information, Thanks for sharing with us… try to share more information. NIce Information, Thanks for sharing MSBI Online Training Hyderabad, check this it for more info.